Nieuwoudtville is a small country village about 400 kilometres to the north of Cape Town. It is just outside the boundary of the Western Cape in the province known as Namaqua or Northern Cape. To reach the town one has to negotiate the Van Rhyns Pass which is 55 kilometres from Van Rhynsdorp the closest Western Cape Town to Nieuwoudtville. The pass rises 820 metres above sea level and takes you from the coastal plain to the top of the pass where you drive out onto the almost flat Bokkeveld Plateau which is quite strange because after reaching the summit of a pass one normally starts going downhill. 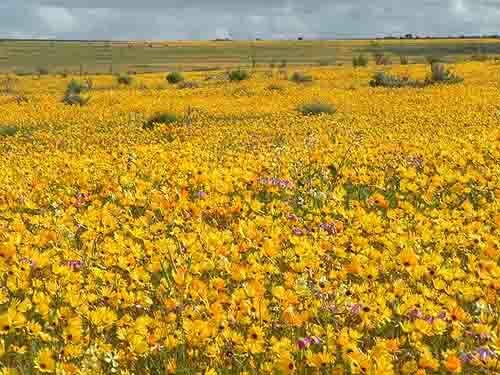 The Bokkeveld plateau which is approximately 100 kilometres long and 75 kilometres wide was first inhabited in the early 1700's when the local trek farmers and the indigenous people of Namaqualand's coastal terrace clashed causing the farmers to move away and settle on the Bokkeveld escarpment. Nieuwoudtville was established in 1897 in a hollow in the flat landscape on a farm belonging to a Mr H Nieuwoudt. A number of sandstone buildings were built in the town from rocks mined in the area. 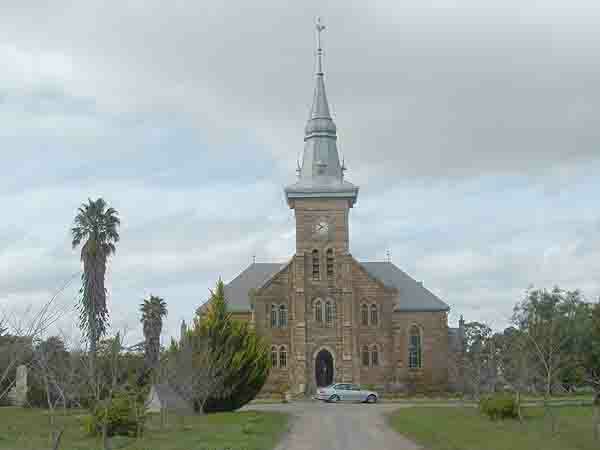 In most country towns in South Africa there is always a Dutch Reformed Church and Nieuwoudtville is no exception. A beautiful sandstone church was completed in February 1906, and today dominates the skyline of the town. The church which has been declared a national monument has oak pews, wrought-iron railings and a magnificent pressed ceiling. At the time all the additions to the church had to be transported by train from Cape Town to Piketberg where they were loaded onto ox wagons and dragged over 250 kilometres through some very difficult terrain to reach the building site. An outstanding feat of endurance by the local parishioners who made the trip. Today one of the outstanding features of the church is its pulpit which is built of white sandstone that has not discoloured over the 100 years the church has been in existence. The plateau where the town is situtated is arid, dry and dusty but after good winter rains the area is transformed into a wild flower garden that is so beautiful that it is difficult to describe. In the fields there are 1 350 species of plants with more than 600 species growing in the the vicinity of the town. 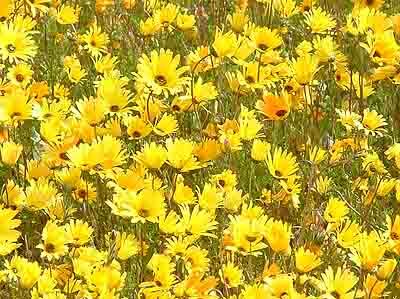 Forty of these plant species are endemic to the Bokkeveld and twenty two of them grow in and around Nieuwoudtville. The flower bulbs are known as geophytes and their diversity is unbelievable. In a small area around the town there are 309 different species of plants to be found. The bulbs are so plentiful that it is not uncommon to find up to 25000 bulbs or 50 different species of plants in a square metre of soil. At this density, a spade full of soil will contain more than a 100 bulbs. The reason for the large variety of plants growing in the area around the town is that there are four distinct vegetation types. They are the Fynbos, the Renosterveld which includes the geophytes, the Dolerite Renosterveld which also contains geophytes and the Karoo with its succulents. The combination of these four types of vegetation is not a normal occurrence in nature but in this case adds to the splendour of the area during the flowering season. Other than flowers there are a number of other attractions in the Nieuwoudtville area as well. One of them is the Doorn river which flows inland from the escarpment and which has, over time, carved out a magnificent gorge along the plateau. In the river is a 90 metre high waterfall that plunges through a hole in a cliff face before flowing northwards to join up with the Hantam river on its way to the sea. 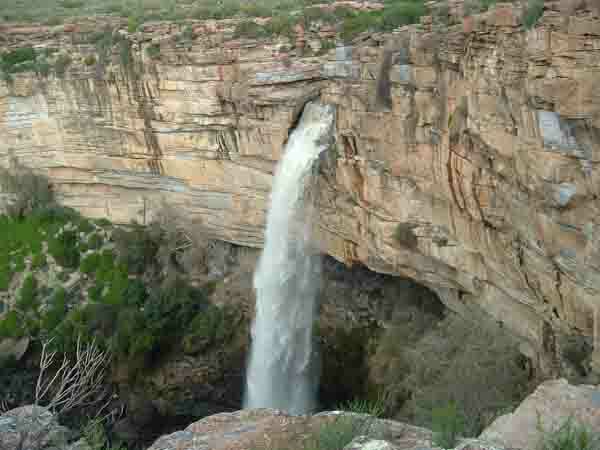 The rock formations near the waterfall are spectacular and are home to a wide variety of plant and bird life. Over 300 million years ago when much of South Africa was covered by ice a glacial pavement was formed near the town by an extensive sheet glacier as it moved over the ground scoring the bedrock and leaving deep grooves which were later filled by pebbles and stones when the ice melted. The rock formations left behind by the ice tend to impede water infiltration causing damp patches to occur along its course. Over the years these patches have become the habitat of some of geophytic plants found growing in the area. For the visitor this unique piece of South African countryside has even more surprises in store. Not only do flowers bloom in spring which occurs during the months of August and September but sometimes also in autumn. For a second flowering to occur there must be a downpour of more than 15mm of rain in February or March. If the veld gets its required amount of rain a miracle occurs as out of nowhere suddenly appear the candelabra-like Brunsvigia bosmaniae flowers which open three weeks to the hour after the downpour and fill the veld with their beauty. The Nieuwoudtville area has been blessed with such beauty and such an abundance of flowers that it is no mistake that it is called the bulb capital of the world. If you happen to be in Cape Town during August and September make an effort to get to the Bokkeveld to see the wonder of nature. You'll be so glad you did.